The Sita Addressable Sounder/Strobe Low Profile allows a simple and effective visual indication directly from the addressable loop. Whilst in alarm, the Sounder Strobe synchronisation is uniquely reset every 10 seconds to ensure that the beacon's flash rate remains in absolute synchronicity across the entire system. The Sounder Strobe offers the choice of 7 different sound patterns and 3 volume levels. 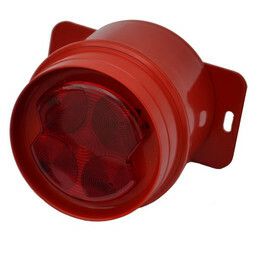 The addresssable Sounder Strobe is ideal for areas that do not require automatic detection. Audible and Visual warning is available in this easy to install compact unit.